Well, I am slow as tortoise, that is for sure! I did manage to get 16 blocks of this quilt pieced, and did enjoy the little time I did have to sew today!! I cleaned, did laundry, cleaned some more, ran errands, paid bills, ran a mile (snuck that one in on ya'! ), cooked dinner...you know, the usual stuff a person does on their day off. I have some really oldie fabrics in the turtle quilt...whatever had some green in it was in!! Our Iris are blooming...they are just so much prettier than the picture represents. They came from my Mother-in-law's home...they were pushing over her house and paving over her gardens, but I went and saved her iris!! And so glad I did!! I had an old BOM that I just really didn't like once I had it...so I made basket blocks instead from the fabric. So, here are the basket blocks on point, but I thought that maybe I could make blocks as above? Again, what is your opinion? Thank you for your help! The basket block is 4 inches finished, and very easy and fun to do. Speaking of OLDIES....I made a turtle quilt many years ago, of all greens. Now at that time, I just used whatever greens I could find, and made the quilt. The original quilt that I found inspiration from was in my mother in law's home...she said I could have it, but another family member wanted it. So, I determined to make a pattern from her original quilt and make one for my husband. And so I did! Anyway, long story longer, I found that I had lots more blocks cut out and stashed away...enough for a whole other quilt. Yahoo!! So I am finishing them up, and the curved piecing is really not hard at all, because the pieces are huge! 6 inches at least...12 inch blocks...easy-peasy!! Hi Y'all! 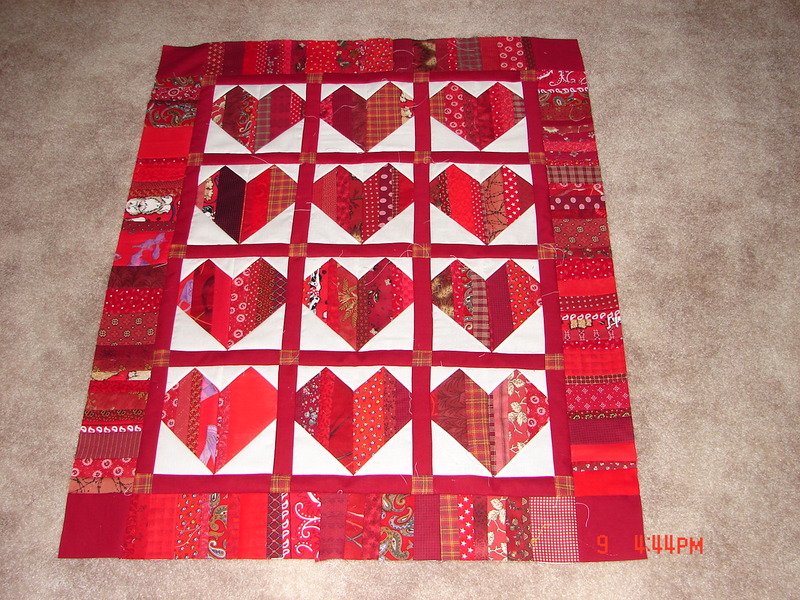 Well, I just really wanted to make a red and white quilt too...and really liked the basket block! So I designed this block...rotary cut, chain pieced...super quick and fun! Of course, the basket handles all need to be hand appliqued down. Insomnia work, that!! I need your help, though...how do I set these together? On point, as picture number one? All facing one direction, straight set, as number two? or alternating rows, as in the third picture? 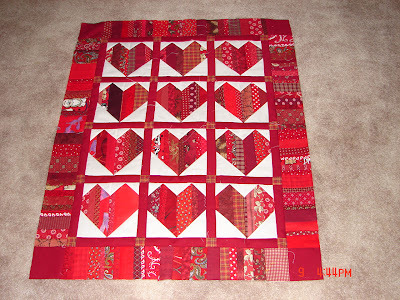 Or with alternate squares, or sashing? I would love to know your opinion!! Hi everyone! Ready for the weekend!? I put this little top together...heart strings!! I did not use up all the red strings I had, so I packaged them all back up and put them away for another day. I had the opportunity to go to the Dallas Quilt Show today! I met Lois Arnold, a wonderful friend met through this blog. Lois is just as nice in person as She is on her blog...and she is a quilt author and wow! A wonderful quilter!! Please click on her name to go to her blog. I also saw friends old and new...quilters, nurses and both! Even a pAtient's wife who had recently been hospitalized. It was great fun!! Good morning to everyone! I hope your day is going well...this is what I finished this morning. I tried to stick to mostly bright colors, but a few muddy ones crept in there too. These blocks were great fun!! The pieces are pretty large, so the quilt came along quickly. This is a pretty large quilt...for a bed. I like it so much! Hey, I just noticed a humility block there...can you see it?? Hee!! making heart string blocks. Did you know that the human heart really has "heart strings?" They are the Chordae Tendineae, and along with the papillary muscles, help to open and close the heart valves. I recently had a patient with a Chordae that ruptured...he had to go for an emergent mitral valve replacement. He is doing great, and surprising, had never been to the doctor or hospital is his life before! I have a wild restlessness about me lately...as if I can't stand another day of sameness. Do you ever feel this way? And what do you do about it? ?